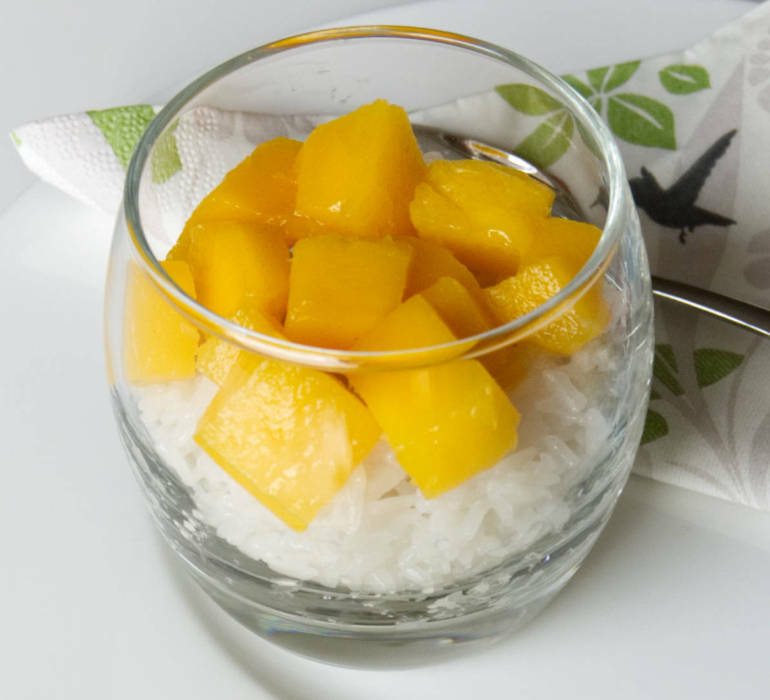 Thai coconut sticky rice with mango is the most famous Thai dessert – and for good reason! It’s simple and delicious. It’s ingredients you can find in any bigger supermarket! The rice is sweet, because it’s soaked in coconut syrup and a little bit salty which gives it very interesting taste. The mango goes so well with it sweetness. Since we came back from our trip to Asia we have made this dish several times and I believe we have mastered it! In Bangkok we have taken cooking classes where we have learnt how to prepare this amazing dessert. To be honest with you, that was the only time when we got to try it. To make the preparation easier we have also published a video on our YouTube Channel so you can watch all preparation steps. Before recreating this dish you will have to wash the rice at leat 5 times in a cold water. As soon as the water is clear you need to soak it in a small bowl for at least 4 hours or overnight. After this time we are going to drain the rice. Be careful with it, you don't want to break the grains. Make sure your drained it well. Place muslin or cheesecloth in the steamer. Make sure to fold the edges so you won't have problems with taking out the rice. Don't put the rice over the whole rack to avoid trapping the steam. The rice has to cook 25-30 minutes. In the small pot we will put coconut milk, sugar, salt and keep on stiring. Use the medium heat. As soon as the sugar is disolved your syrup is done. That might take 3-5 minutes. Do not reduce it, we need a lot of liquid! The syrup should have light grey color. Your syrup has to be done before the rice is, so put the lid on it and keep it warm until the rice is ready. In the meantime our rice is ready so we will take it out, put it in a large bowl and pour the syrup over and stir. We will cover the bowl with the lid and come back in 20 minutes to give it another stir. You need to make sure you are quick, the rice can absorb more when it's still warm. After 20 minutes we will flip our rice over. The liquid has mostly been absorbt. We will fold the bottom up and leave it for another 20 minutes. Serve your coconut rice with mango on the side or on the top. It's a great dessert or even breakfast! You can do the coconut sticky rice ahead of time and keep it in the room temperature. If you would like to serve it the next day then put it in the fridge. Are you crazy about sweet dishes from Asia? Here is another recipe that you should check out: Traditional Vietnamese Egg Coffee.